Our modern insistence on democratic social values has engendered an intense debate over the intersection of fundamental rights and contract law. In particular, case law in several European national jurisdictions has exerted significant pressure on traditional contract law instruments to conform more transparently with the fundamental rights enshrined in the EC Charter. This pressure is clearly evident in a number of societal areas subject to contract law, among them employment, housing, and privacy. It can even be argued, as this author does, that fundamental rights intermediate between politics and law. • To what extent do fundamental rights affect contract law? • In which types of cases can fundamental rights be applied? • What does the explicit consideration of fundamental rights add to contract law adjudication? 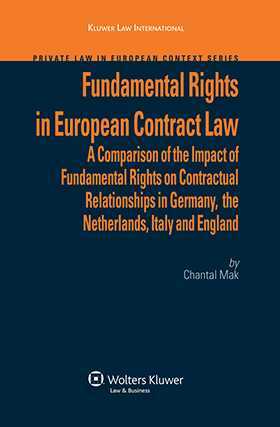 The author approaches the analysis along two different avenues: first, a comparative overview of developments in case law, and second, a more general theoretical view on the interaction between fundamental rights and rules of contract law which is tested against examples from various legal systems. The focus throughout is on developments in case law, because the impact of fundamental rights in contract law has been felt on the level of dispute resolution rather than on the level of legislation. Germany and the Netherlands are chosen because their judiciaries have been notable for their early and continuing attention to the theme, and England and Italy for perspectives on developments under common law and civil law systems respectively. For its reframing of old questions and its insightful delimitations of new ones, this book offers a fresh and deeply informed new perspective on this important area of developing law. The discussion, moreover, has received an additional impulse from the debate leading up to the recent agreement on a Reform Treaty regarding the institutional settlement of the Union, which will give a legally binding status to the Nice Charter of Fundamental Rights. For these reasons and others, the book will be of great value to all interested parties in government, business, and legal practice. Introduction. Part I: Fundamental Rights in European Contract Law. Developments in Case Law. Introduction to Part I. 1. Freedom of Contract and Fundamental Rights. 2. Interaction between Fundamental Rights and Contract Law. 3. A New Perspective on Effects of Fundamental Rights in Contract Law. Epilogue to Part I. Part II: The Intermediary Role of Fundamental Rights in European Contract Law Adjudication. Introduction to Part II. 4. Changing Perspectives: Starting Points for a Comparative Legal-Political Analysis. 5. Fundamental Rights and the Political Dimension of Contract Law. 6. Testing the Fundamental Rights Hypothesis. 7. What the Comparative Legal-Political Analysis Explains. Epilogue to Part II. Summary and Conclusion. Bibliography. List of Cases.